Through a miscarriage of justice, John Ingram (Edward G. Robinson) is convicted of a crime he did not commit and sentenced to a long stretch on a chain gang in the deep South. In time, Ingram flees to Oklahoma, where he makes a living fighting oil fires under an assumed name. Several years later, he has a successful business, a loving wife (Ruth Hussey), and a child. But he still lives in fear that his secret will be revealed, and one day he's visited by William Ramey (Gene Lockhart). Ramey admits that he committed the crime for which Ingram was convicted; he proposes that they meet with the authorities together, and Ramey will sign a confession that will clear Ingram's name. But Ramey instead double-crosses Ingram, putting him back on the chain gang while Ramey lays claim to his business. Before long, Ingram learns that his wife and child are nearly broke thanks to Ramey's gutting of his once-thriving business, and he decides that he must once again escape if he is to protect the safety of his family. 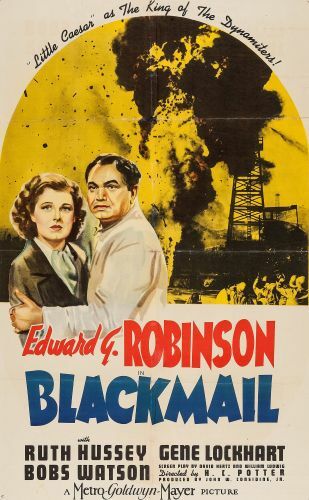 Blackmail marked one of Edward G. Robinson's first "good guy" roles after making his name in a series of gangster epics; a year later, he would be starring in prestigious biopics, such as Dr. Ehrlich's Magic Bullet and A Dispatch From Reuters.